Make the most of the warm weather this weekend and head off on an outdoor adventure with the family. Ideal for picnics, nature walks and soaking up some sun, these parks and gardens around Yorkshire offer a scenic spot to relax and unwind. Visitors will be spoilt for choice with things to do at the popualr Bolton Abbey Estate in Wharfedale. Put your balance to the test crossing the 60 stepping stones, take a walk to see the Strid in the ancient woodland, enjoy the scenery along the nature trails, or nestle down on the lawns in front of the magnificent 12th century ruins. 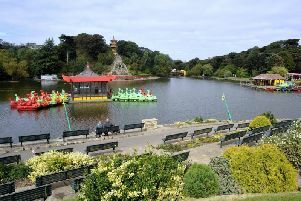 Hugely popular for its pretty gardens and circular lakeside walk, this north Leeds park stretches across 55 hectares, providing plenty of space to bask in the sunny weather. There's a huge amount of space to set up a picnic, or you can head to the on-site cafe if you'd prefer. Combine sightseeing with outdoor adventures at Oakwell Hall and Country Park, where you can take a tour of the bautiful Elizabethan manor house, which offers an intriguing insight into the late 17th century, before heading off to explore the 110 acres of country park which surround it. The vast estate is home to a network of footpaths and nature trails, where you can expect to find glorious scenery, flowers and wildlife along the way. This nineteen acre park in Halfax is perfect for an active day outdoors, thanks to its many exciting on-site attractions. Alongside woodland walks, a walled garden and wild flower area, children will love playing in the water park and sand pit, or spotting an array of exotic plants and creatures at The Jungle Experience, the park's tropical on-site greenhouse. There's also plenty of spots to set up a picnic and if you're feeling energetic, there is an outdoor gym where you can work up a sweat. These English Heritage grade II listed gardens in Harroage spread across 17 acres and feature an array of different areas giving visitors plenty to explore. Have fun in the playground, skate park, boating pool and games areas, which include tennis, pitch and putt and crazy golf, take a dip in the paddling pool, or simply take some time out to wander the footpaths through the gardens. If you're looking for a park that is a little more out of the ordinary, Yorkshire Sculpture Park won't disappoint. The magnificent open air gallery is home to around 80 sculptures and installations, offering a more unqiue way to appreciate some contemporary art by some of the world's finest artists. Tucked away in a secluded valley, visitors are guaranteed to be impressed by the vast Cistercian abbey ruins and Georgian water farden at this National Trust site in Ripon. A medieval deer park, Elizabethan Hall and Gothic church are also on site to see, while the vast green lawns which lead down to the riverside provide a wonderful spot for a picnic. A firm favourite spot to soak up some sun in Leeds, Roundhay Park stretches across 700 acres of pretty parkland, lakes and woodland, providing a picture-perfect location for leisurely picnic. Youngsters are well catered for with two playgrounds on site, along with the popular Tropical World visitor attraction where a variety of exotic animals and plants can be seen. This stunning 18th century historic house just outside of York stands within 1,000 acres of glorious landscape, with lakes, fountains, woodland, temples, rolling lawns, an ornamental garden and a children's playround just a few of the delights which await to be explored in the grounds. Nestled just half a mile from Huddersfield town centre, Greenfield Park is the perfect spot to escape the hustle and bustle, and enjoy some time outdoors. Home to a skate park, tennis courts, play areas, paddling pool and ornamental lake, as well as a miniature steam railway, there's a great variety of attractions to keep the whole family entertained. And visitors can even enjoy horse and carriage rides on weekends.